Fr Ross was born and bred in the parish of Rumney. He attended the local primary school, at Greenway, and later went to St Teilo’s Church in Wales High School. Fr Ross read Theology at Regent’s Park College, Oxford, and it was during this period that he began exploring his vocation to ordained ministry in the Anglican Church. After graduating in 2015, Fr Ross returned to Cardiff to read for a Masters in Christian Doctrine (Theology) at Cardiff University, exploring how the Blessed Virgin might be a focal point of unity among Christians of all traditions. His paper was published by the Ecumenical Society for the Blessed Virgin Mary, and has invited a response from another Marian ecumenist. Fr Ross trained for the Priesthood at the St Padarn’s Institute. Fr Ross was ordained to the Diaconate by Bishop Richard Pain in 2017, and began serving his title here, in the Parish of St Augustine’s, Rumney. 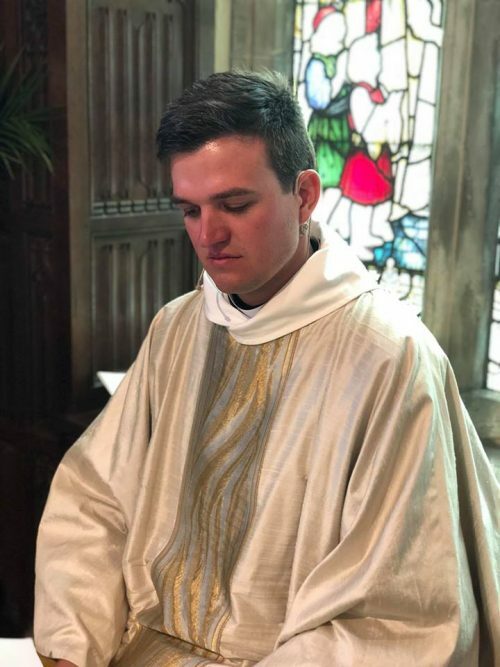 Fr Ross was ordained Priest in 2018 at Newport Cathedral, and has since been appointed as an assistant CMD officer for the Diocese by Bishop Richard. Fr Ross is himself committed to ongoing theological development, and is currently pursuing a research degree at Cardiff University. His project considers how a social doctrine of the trinity might offer a theology for new collaborative patterns of ministry, as the Church in Wales implements its 2020 Vision. Fr Ross is married to Steph, and together they have three ‘fur babies’ (rag-dolls) named Wilfred, Hermione, and Esmé. His interests include travel, politics, and Taylor Swift. Error: Error validating access token: Session has expired on Saturday, 06-Oct-18 08:26:18 PDT. The current time is Sunday, 21-Apr-19 11:02:11 PDT.